BERLIN - The Berlin girls basketball team is heading into the postseason with plenty of momentum. 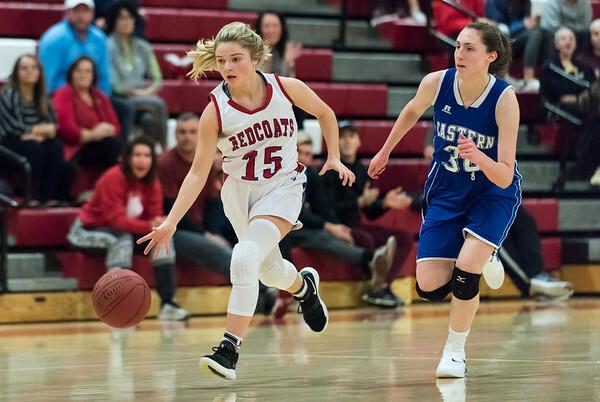 Lyzi Litwinko finished with 23 points and 10 rebounds, while Ashley Wenzel added 19 more as the Redcoats beat Middletown 72-56 Monday night to wrap up their regular season unbeaten on their home court and as CCC South champions. The Redcoats (16-4) will most likely host a first-round game of the CCC Tournament. Berlin got plenty of production offensively outside its top two scorers. Carly Grega finished with 12 points and Angela Perrelli added nine. Wynter Yovan pulled down 10 boards to go along with her four points. The Redcoats and Blue Dragons went back and forth for the first quarter, but over the next eight minutes before halftime, Berlin was able to pull away thanks to a 9-point differential in the second quarter. The Redcoats were able to slowly build on their lead over the second half. Kya Mayo led Middletown with 23 points. Wethersfield 50, Newington 38: Nicole Gwynn dropped 24 points, including number 1,000 of her career, to guide the Eagles (15-5) past the Indians (17-3) on Monday night. Wethersfield jumped out to a six-point lead in the first quarter and coasted from there. Ashanti Frazier scored 15 points for Newington, while Olivia St. Remy grabbed 10 rebounds to go along with her four points in the losing effort. The Eagles outscored the Indians 14-1 from the free throw line. HMTCA 49, Innovation 27: The Ravens once again struggled offensively without Ariana Rivas, scoring just nine points in the first half in a road loss to HMTCA. Te’ijah Roberts stepped up for the Ravens in the losing effort, scoring 10 points while recording five assists. Breanna Santana flirted with a double-double, finishing with seven points and 10 rebounds. Nicole Rosado led the way for HMTCA, scoring 24 points on eight field goals. Innovation 63, Conard 39: After a shaky first half, the Ravens showed the Chieftains why they had yet to lose multiple games this season. Innovation held Conard to just 11 points over the final 16 minutes of play, including two in the third quarter en route to its 17th win of the season. Lenny Okonya finished with a double-double for Innovation, scoring a game-high 26 points, while pulling down 16 rebounds. He also had six blocks. His teammate, Carlos Gonzalez, ended his night with 20 points, including six 3-pointers, and six assists, while Lester Emmanuel record five assists. “Lenny really began to finish strong at the rim and in the paint in the third quarter and made us that much better,” Lance said. Berlin: Lyzi Litwinko 8-7-23, Ashley Wenzel 5-8-19, Arianna Hender 1-0-3, Wynter Yovan 2-0-4, Angela Perrelli 3-1-9, Carly Grega 4-2-12, Zenae Lewis 1-0-2. Totals: 24-18-72. Three-point Goals: Wenzel (B) 2, Hender (B) 2, Perrelli (B) 2, Grega (B) 2, Pettaway (M), Mayo (M) 3. Wethersfield: Gabriella Amoddio 1-1-4, Alexa Grenier 1-0-2, Isabella Samse 2-0-4, Alice Kelly 4-4-13, Grace Conneely 0-1-3, Nicole Gwynn 7-8-24. Totals: 15-14-50. Records: Newington 17-3, Wethersfield 15-5. Innovation: Chelsea Wray-Brown 3-0-7, Te'ijah Roberts 3-2-10, Breanna Santana 3-1-7, Armanie Colon 1-0-3, Lydia Bishop 0-0-0, Gabby DeJesus Brown0-0-0. Totals: 9-3-27. HMTCA: Taleea Wiggins 2-0-4, Nicole Rosado 8-8-24, Karina Ortiz 3-0-9, Krystal Albert 1-0-3, Cyani Irizarry 2-0-4, Sarah Crowell 1-0-3, Tanyeja Richardson 1-0-2. Totals: 18-8-49. Records: Innovation 6-13, HMTCA 5-13. Conard: Josiah Rivers 2-0-4, Gurjot Singh 0-2-2, Evan Smart 1-0-3, Brian Puleo 2-0-4, Connor Mckeown 3-0-7, Christian St. Juset 2-1-5, Arsen Shtefan 1-2-5, Chase Fountain 1-0-3, Peter Simplicio 2-2-6. Totals: 14-7-39. Innovation: Armoni Alonso 0-1-1, Carlos Gonzalez 7-0-20, LJ Hazelwood 1-2-6, Lenny Okonya 11-2-26, Gabe Matias 1-0-3, Remeish Bogle 1-2-5, Lester Emmanuel 1-0-2. Totals: 24-5-63. Three-Point Goals: Gonzalez (I) 6, Okonya (I) 2, Matias (I), Bogle (I). Records: Innovation 17-1, Conard 3-14. Posted in New Britain Herald, Berlin, Innovation, Newington on Monday, 11 February 2019 21:51. Updated: Monday, 11 February 2019 21:54.